Homemade Lemon Vinaigrette. I made you a healthier lemon vinaigrette! I am a big fan of homemade salad dressings. Homemade salad dressings are so easy to make. The best part is that you can control the ingredients! This lemon vinaigrette recipe will freshen up any summer salad, and takes only a few minutes to make! If you like lemon recipes, you may also like this and this. 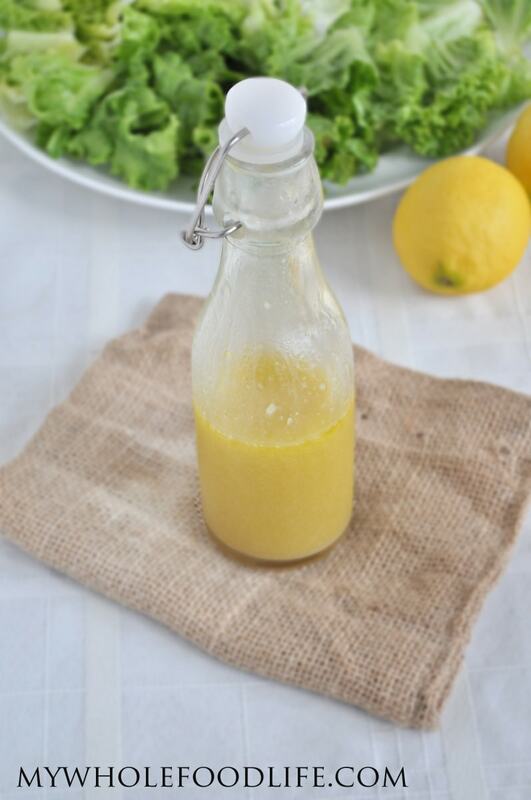 This homemade lemon vinaigrette recipe contains no processed sugars. I used a tiny bit of maple syrup to balance out the tartness of the lemon juice. You could probably also use honey, but I used maple syrup to keep it vegan. 🙂 If you like homemade dressing recipes, then you may also like this post. Homemade dressing is so easy! In a small bowl , whisk together all the ingredients. To mince the garlic, I used a microplane . It makes it super easy! Store the dressing in the fridge. You will need to shake before using each time since the oil and lemon juice will separate.